My maternal grandfather, Oscar Shelley, a rural mail carrier for 33 years, 1927 to 1960, wore out a new Chevrolet every two years on Route 2, Seymour, TN. Well, that was in the latter part of his career. For the first seven years, he rode a horse on a 27 mile Route with 88 mail boxes. Starting pay was $36 a week. Granddaddy was appointed to the job by Tennessee Republican Congressman B. Carroll Reece (1889-1961). The Post Office was political in those days and when the administration changed, the Post Master often changed as well. 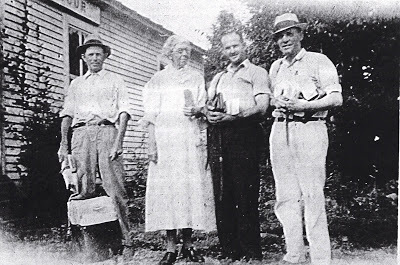 My grandmother, Ezalee Marshall Shelley, also worked 15 years as a clerk in the little post office that was just a few hundred yards from their home. I remember being there with them in the morning, with the distinctive odors of ink and paper, as the mail was sorted and the carriers discussed who lived where and made sure the mail was divided up and arranged for proper and efficient delivery. At Christmas each year Granddaddy would put a little box of stick candy in mailboxes of homes with children he thought might not otherwise have any Christmas gifts. I know he was thankful for the job and I suppose that was one way he could express his thanks. Granddaddy once took me on his route in the back seat of his car, warning me, tongue in cheek, at each intersection and for every passing vehicle to get down on the floor out of sight so he wouldn’t get in trouble. He loved to tease. Traffic was thin so I didn’t spend too much time on the floor. Carrying the mail was a prestigious and important job, linking all the citizens of the country well before proliferation of telecom, radio, television, and digital communications. Rural Free Delivery (RFD) had been established in 1896 with an initial appropriation by Congress of $40,000. Before that, farmers who comprised 60% of the population had had to head into town to pick up their mail at the Post Office. Interesting history here. But change continues and now the USPS is facing competition and losing out to the lower cost and higher speed of digital communication. It presents an opportunity to save taxpayer money, but that is not easily accomplished in the public domain. Mail volume is down more than 20% since 2007, and it would be a lot worse if all the junk items, including political campaign propaganda, credit card offers, fund raising pitches, and catalogues that go directly to the trash unopened could be eliminated. It’s a lot easier, and a lot cheaper, (and a lot greener), to get rid of junk email than junk snail mail. At one time, two a day deliveries were considered justifiable. Of course we still need snail mail because millions are not digitally connected, but delivery on alternate days should be fine. And the USPS can’t even reach agreement with Congress on giving up Saturday deliveries. Could this be due to union influence and the reluctance of a Congress hungry for votes to say “no” to any constituency? We could be comforted by the fact that the USPS receives no tax dollars except for one little complication: The Federal Government controls policy of and loans money to the USPS. I wonder if those loans will be repaid or forgiven.